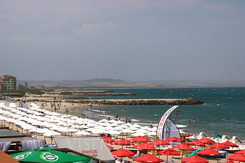 Pomorie Beach Resort on the Black Sea in Bulgaria. Book spa and wellness holiday in Pomorie beach resort. 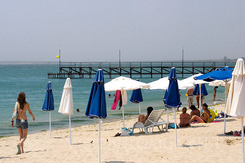 Pomorie is situated on a narrow rocky peninsula, 20 km away from Bourgas and 18 km away from the resort Sunny Beach. The town was founded in IV B.C. near the salty lake called by the ancient Thracians "sacred" because of its curative abilities. The climate is favorable: continuing sunshine which reaches up to 2360 hours annually. The average temperature of the air and the water in July is 23,6°C. Pomorie curative mud, extracted from the salty lake, is among the best in the world. The shore is low, sandy, with a fully open horizon to the east and to the west. The beach line covers an area of 18 700 sq. m. The shallow and flat coastal line, bottom of the sea, with a slight slope and the cold sea currents make it safe for children and inexperienced swimmers. Comfortable transport junctions connect Pomorie with other towns and resorts. The airport is only 8 km away. 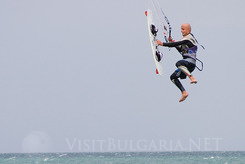 The Pomorie Bay is preferred for yachting, sailing and fishing. Together with wine-growing, wine-producing, production of salt, fishing and tourism Pomorie is getting more and more attractive balneological resort.